Jan Brett has taken a "cute" classic and given it her own special touch! There are two stories happening at once. The main story on the page and the clues about future pages in the border. Making gingerbread has never been so eventful! The story begins with a boy named Matti (he's Swiss) and his mother mixing up a recipe for fun (really it's gingerbread). Matti is a typically impatient child and opens the oven too soon. 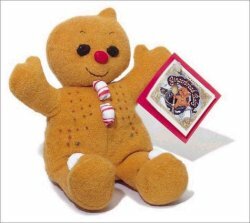 Out jumps a gingerbread baby! He is adorable . This spunky little gingerbread baby outwits and outruns a variety of villagers. So, one cat, one dog, several goats, two sisters, one pig and a crowd of hungry villagers later, he is still running and singing his song: " I am the Gingerbread Baby, fresh from the pan. If you want me, catch me if you can." Meanwhile, Matti has plans of his own. He bakes again, being careful to wait the full amount of time. 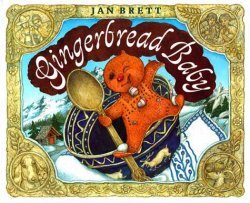 The Gingerbread Baby does meet a fox in this tale, but not with the expected results. He spies what Matti has been preparing during his adventures. By the time everyone catches up to him - the Baby is gone! And only Matti knows where he went. And he's not telling! This is a great gingerbread tale. It is longer than usual, but I believe it is so enthralling, that even 3-5 year olds will sit for the fun of it! Jan Brett's paintings of the Swiss countryside and the creations along the page borders are intricately detailed . Children (and the adults who read to them) will find something fresh and interesting each time they open this book!